One of the last things that my husband and I did before our daughter was born was to plant our little herb and veggie garden outside on our patio. It's just a small planter garden, but we really enjoy it. This year, my husband got some really great soil and he sort of babied the garden; he has a pretty good green thumb, really. Did you know that he takes care of all of our house plants? It's true. Anyway, our basil really took off and we've already got an abundance. 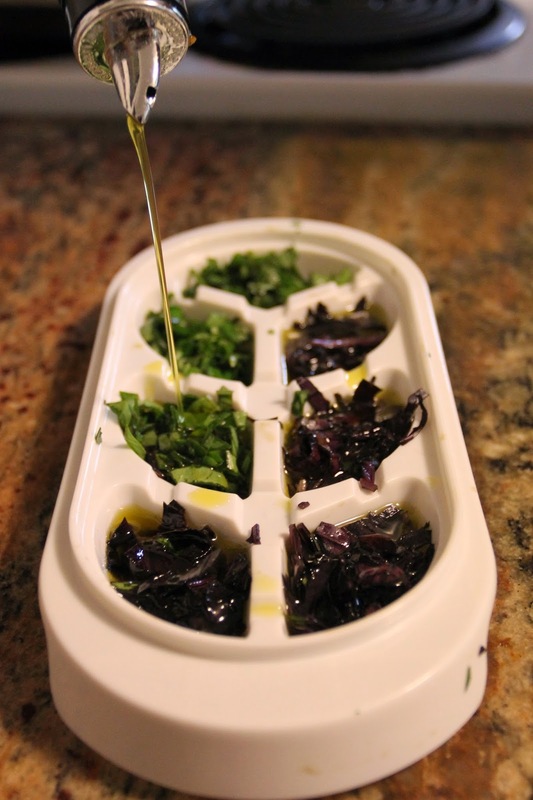 So, it was time to try something we saw on the Internet--that freezer basil preservation with olive oil thingy. Yea, I know, I'm being real descriptive here. Which is why I took pictures. I swear, my mind just isn't what it used to be. It's okay, I'm a mom now, I have an excuse...right? "regular." I think they taste the same, but honestly, the purple basil is cool looking, so... Anyway, I picked a bunch of the biggest leaves off my plants. Now, you can use an ice cube tray for this, but I have these baby food freezer trays and I thought this would be the perfect use for them. So I used those. They are extra awesome because they come with lids which is super duper convenient! Chizzity chop your basil up. And put it in your ice tray or baby food container thingy, as it were. And once full, pour in your olive oil. Then you simply freeze them. When you are ready to use them, just pop em out and add to your favorite soups, sauces, meat or veggie dishes. How easy and awesome is this! ?